Hope you had a wonderful weekend. This week is dedicated to fasting – types, reasons for, and tips. It’s a tool. We might as well understand it. One reason to fast is to get your ketones up so you can get your Glucose Ketone Index, GKI, down. Fasting will get your ketones up and your blood glucose down which means your GKI (blood glucose measure/ketone measure) goes down. Hello math my pretties!!! So what’s the GKI and do you need to think about it? Why you might want to, and when to not sweat it. Do you need to fast to do BB2019? No. Will I still love you if you skip the fasting? Of course. Topic of the day, GKI. What it is and why you might care. Metabolic therapy using ketogenic diets (KD) is emerging as an alternative or complementary approach to the current standard of care for brain cancer management. This therapeutic strategy targets the aerobic fermentation of glucose (Warburg effect), which is the common metabolic malady of most cancers including brain tumors. The KD targets tumor energy metabolism by lowering blood glucose and elevating blood ketones (β-hydroxybutyrate). Brain tumor cells, unlike normal brain cells, cannot use ketone bodies effectively for energy when glucose becomes limiting. Although plasma levels of glucose and ketone bodies have been used separately to predict the therapeutic success of metabolic therapy, daily glucose levels can fluctuate widely in brain cancer patients. This can create difficulty in linking changes in blood glucose and ketones to efficacy of metabolic therapy. A program was developed (Glucose Ketone Index Calculator, GKIC) that tracks the ratio of blood glucose to ketones as a single value. We have termed this ratio the Glucose Ketone Index (GKI). The GKIC was used to compute the GKI for data published on blood glucose and ketone levels in humans and mice with brain tumors. The results showed a clear relationship between the GKI and therapeutic efficacy using ketogenic diets and calorie restriction. The GKIC is a simple tool that can help monitor the efficacy of metabolic therapy in preclinical animal models and in clinical trials for malignant brain cancer and possibly other cancers that express aerobic fermentation. Using a blood glucose and blood ketone meter – particularly if you have the keto-mojo model – just do your regular finger prick for each strip. When you set up your meter, choose the same units of measure for both blood glucose and ketones. Ketones are typically in mmol. You can choose mmol for glucose as well. Well, here’s where I just admit, we’re not quite sure what this will do for a healthy individual. There’s a TON of speculation about what it might be able to do for you, but *sigh* we don’t have much reliable data – that I’ve found so far – of what happens in healthy people. I’m experimenting with it on myself. In folks riddled with disease – think cancers and massive cognitive decline – getting and keeping your GKI under 1.0 (not easy peasy!! ), seems to reverse many conditions. Impressive indeed. Scientific lit below. While pharmacological treatments hover in the 0-18% range, getting and keeping your GKI under 1.0 even for a few weeks shows 6X improvement over pharma. **Of course this is not for every disease or every body, but if you have a problem parent or spouse or even child, pretty please do read the lit! It is incredible. Here are some broad guidelines for what different GKI measures mean. Please note, the vast majority of folks interested in low carb, keto seem to be folks concerned with treating people over 300 pounds. At any height that is obese. How obese bodies respond may be very different from how healthy bodies respond: different gut bacteria, different movement patterns, different hormonal responses, etc. Even the reddit forums are dominated by those with BW, before weight, over 250#. I’m just not sure these markers are appropriate for metabolically healthy, fit folks. This chart is the standard circulating, but again . . . I’m not so sure. 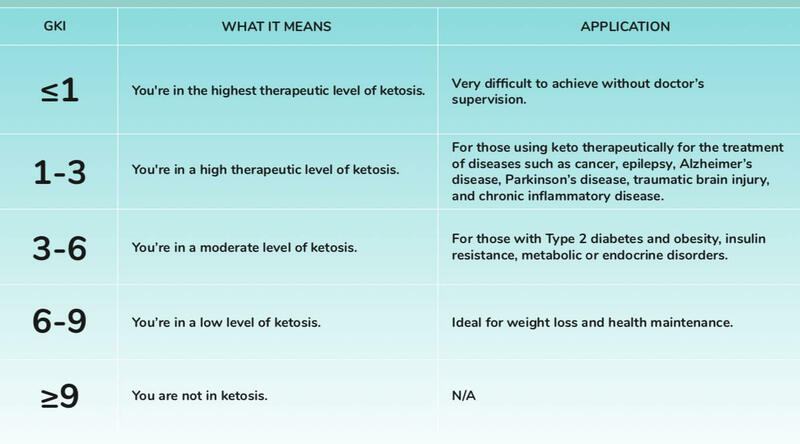 The papers focus on below 1.0 for the therapeutic target and don’t really make a distinction above 1.0 until you reach 9.0 which is fairly certainly NOT nutritional or therapeutic ketosis. So really the hot topic is Autophagy. Doctors and lay people alike have inferred that the GKI chart is a reflection of the level of autophagy. It’s important to remember what we know to be correlated and that we don’t yet know about CAUSAL relationships…. Proceed with common sense and caution. What we have seen (in papers cited above and below) is that GKI < 1.0 confers therapeutic benefits to a wide variety of very serious illness from cancer to Alzheimer’s. What a wide group are speculating on – and I do mean speculating – that other levels of ketosis have similar if reduced benefits. I am not aware of any paper that demonstrates that yet. Then again, who is willing to fund a study on making healthy people more healthy or smarter? You aren’t winning prizes for that. Which is really too bad. You can search the thousands of papers in Dr Google if you want what are really the same lame explanation. Or let me simplify. Autophagy is a collection of cellular clearing processes. There are several -phagies. Mitophagy (selective degradation of mitochondria by autophagy), etc. This is a normal everyday process going on basically all the time. The macroautophagic process is the one most people seem to be referring to when they talk about autophagy, but it is important to remember that autophagy is really several related processes under one umbrella. Here’s how I think about levels of autophagy. When you’re in normal zones the basics are getting done. GKI of less than 6 is a normal zone. This is basically the vacuuming and getting the dishes done. Good work! If you need to remodel the bath, you probably need to get under 3.0 for an extended period. There is evidence that you have more beneficial cell clearing processes at this level. This is partly due to ketone related processes which are less hindered by Insulin when your blood glucose is sufficiently low and your ketones are sufficiently high to get the GKI below 3.0. This is not an everyday state for most of us. But what if you need to remodel the whole house? Nasty mold issue for example…. Well, you need massive rebuilding. Get your GKI under 1.0 and keep it there. Have cancer, get your GKI under 1.0 for 6+ weeks before your next tumor measure. Dad have Dementia? In as few as 3 weeks measures of memory and cognitive performance can improve. Tie shoes again, yes please! See what happens. Not easy. Master Spreadsheet of Low Carb Studies for your leisurely review. BB2019 – Week 4 – Sunday, How Fast Are You?